Hosted by Charles Schwab in partnership with the Colorado Veterans Project, the City of Lone Tree, Coventry Development and South Suburban Parks and Recreation. Bring your family & friends to this special celebration of all that our service members! You’ll join Executive Sponsor and Schwab SVP Brian McDonald, along with other members of the Schwab and Lone Tree communities, in honoring our nation’s best at this special event. When: July 9 at 8 a.m. Event Details: Music, local retailers, 3-mile run & much more! Larkspur, Colo. – Chris Hardesty and his family will receive a life-changing gift on the morning of June 26 when they will be presented with the keys to their move-in ready, mortgage-free home in Pueblo, Colo. The home, donated by the Colorado PGA REACH Foundation, will be given to the Hardesty family through the Homes 4 Wounded Heroes program. Former U.S. Army Sergeant Hardesty, who served as a Cavalry Scout, was injured while on patrol in Afghanistan when the M-ATV he was traveling in was attacked with an IED. The Purple Heart, the Army Commendation Metal and the NATO Medal are just a few of the awards that have been bestowed upon Hardesty. The Second Annual Colorado PGA REACH Invitational Fundraiser will be held on June 26 at the Colorado Golf Club Championship Course in Parker, Colo. The event is open to all golfers interested in being a part of this great cause. Teams will be comprised of three amateurs and one Colorado PGA professional. Event registration is open through June 21 at https://copga.bluegolf.com/bluegolf/copga17/event/copga1724/index.htm. Media and news organizations are encouraged and welcomed to cover this life-changing event. The Military Warriors Support Foundation, a non-profit based in San Antonio, Texas, is the sponsor of the Homes 4 Wounded Heroes program, a renowned national military charity that focuses on placing eligible veterans and their families in their own homes. $2499.00 per Team, $833.00 per Person (each Player will receive a donation statement for $400 to Colorado PGA REACH). $100 per team will be charged at registration with the remainder charged once the deadline for registration closes. Entry Fee includes Breakfast, PGA Instruction on the Practice Tee, Golf, Cart, Caddy, Open Bar throughout the day, Cigars, Lunch, and a custom built wedge from Callaway! Veteran’s Passport to Hope is excited to announce that for the entire month of May, we are the sponsored charity for The Melting Pot Restaurant in both Littleton and in Louisville. A portion of the proceeds from all the 4-course, charity wine dinners sold during the month of May will go to Veterans Passport to Hope! So grab a date and go eat for a great cause. On Thursday June 22nd, The Melting Pot in Historic Old Town Littleton; the most awesome fondue place around; has graciously allowed Veteran’s Passport to Hope (VP2H) the use of their patio for a special night of Veteran appreciation. Tickets: 125.00 each, two for 250.00. 100% goes to VP2H, gratuity not included. As part of the evening’s event, VP2H is honored to have US Army Specialist (Ret.) and Purple Heart recipient Anthony “Tony” Drees as a special guest of honor in attendance, whom is also now VP2H’s Executive Director. Tony embodies a warrior spirit and what it means to fight. In 1991 Tony was wounded by a SCUD missile attack, which left 27 US troops dead, and an additional 98 injured. Tony now serves as a military transition expert, life coach, and mentor to many. Price per person is $125, but tickets are sold by couples $250 per order. Wine type choice *for couples tickets: white or red wine, to be chosen on site. Cash bar if you would like more than one bottle of wine, However, sodas, coffee and tea are included! Rain Date: In the event of rain the rescheduled date will be June 29th, 2016. A Champagne toast is also included in the package. Sobriety House has been in the community for 50 years! To celebrate, we are hosting an Open House Thursday June 22, from 4:00 to 6:00 on our Main Campus. Please plan to drop by and join us! It will be a great opportunity to learn about us, or get reacquainted with our programs, eat some good food, and make great connections with others! For more information, and to RSVP, go to www.sobrietyhouse.org! DTC LOCATION - 8100 EAST UNION AVE.
JOIN STEFFAN TUBBS AT THE ANNUAL HIGHLANDS RANCH MEMORIAL DAY PROGRAM. The community is invited to attend a Memorial Day Service May 29 at 11:45 a.m. at the Highlands Ranch Veterans Monument. Memorial Day is a day to honor the more than one million men and women who gave the ultimate sacrifice for our country. The Memorial Day Service is made possible by the work of volunteers Tom and Diane DiRito. 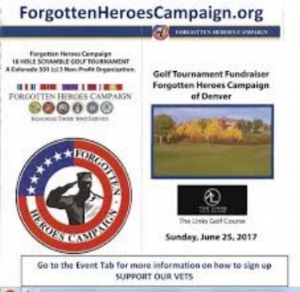 The event includes participants from Douglas County Sheriff’s Office, Littleton Fire Rescue, Highlands Ranch American Legion Post 1260. Arrive early and read the tiles at Highlands Ranch Veterans Monument prior to the event. Seating is not provided. Bring your own chair if standing for 25 minutes is an issue. Guest speaker: SGM (retired) Meg West. "As a combat veteran... this is the most powerful film I've ever watched." This is Memorial Day weekend... if you can't watch live, set the DVRs! Celebrate with the Colorado High Plains Adventure for the “Spring Farm Festival." NO admission fee and fun for all ages! Saturday May 27th from 10:00 a.m. – 4:00 p.m. Caramel Apple Farm is located at 5690 South Tom Bay Ct., Bennett, CO. No dogs allowed. Please registered service dogs only. We want to extend a big welcome to our Veterans. Bring a package of socks with you to the festival and qualify to enter a free drawing. Our deployed troops love getting new socks! Many farmers, ranchers and local businesses are gathering together at Caramel Apple Farm on May 27th to bring you the Spring Farm Festival. Visit the May Farms booth to learn more about their special events, pumpkin patch, corn maze, barn dances, baked goods and dinners. Pick up some handmade jellies, jams and vegetables all made fresh from the gardens of Eastern Sky Alpacas. Come out, spend the day, enjoy live music, celebrate our veterans, eat and have fun. While you are in the I-70 Corridor stop by for the 3rd Annual WarBird Auto Show at Front Range Airport located at 5200 Front Range Parkway in Watkins, Colorado. May is National Military Appreciation Month when we honor, remember, recognize and appreciate all military personnel; the men and women who have served throughout our history. On May 25, we are honored to observe Military Appreciation Month with the showing of the documentary film, ACRONYM: The Cross-Generational Battle with PTSD. It examines the post-war lives of more than a dozen Colorado veterans who experienced the worst of war and subsequently the mental trauma they brought home. This powerful film has been shown to veterans, military charities, VFW/American Legion posts and to lawmakers on Capitol Hill in Washington D.C. The film’s director, Steffan Tubbs, will introduce the film. Tubbs is the host of The American Veteran Show on KOA NewsRadio Saturdays at 6:00 am. All attendees will receive a DVD of the film to share with friends and family members. Dogs play an important role in helping Veterans* cope with reintegration. Unfortunately, though, resources are not widely available to help provide veterinary care for their companions. In fact, many Veterans experiencing hardships choose between resources for themselves and their companion animals, potentially compromising their own welfare. On Armed Forces Day, May 20 2017 - the “Ainsley Price Day of Service for Veterans” - Veterans won’t have to choose: veterinary students from the Colorado State University College of Veterinary Medicine and Biomedical Sciences will provide exams and services to canine companions under the guidance of licensed veterinarians; case coordinators from Denver Public Health will conduct “Heart Health Screenings” for Veterans; and a representative from an in-home dog training company will offer dog behavior tips. Best of all, all services will be free in appreciation of Armed Forces Veterans’ service. If you too would like to help please follow the La Alma-Lincoln Park Neighborhood Association and donate to VOA’s “Peer Program.” “Peer Program” funds will be used for counseling and related services. Checks should be made payable to Volunteers of America Colorado with “Peer Program” in the memo line. You can also help by bringing a can(s) of food for the VOA’s Food Bank. *Veterans: Please bring proof of service for validation prior to receiving services. VACATIONS FOR WARRIORS - THIRD ANNUAL LUAU! A very special thank you to our friends and partners, the Elk's Lodge #1650 in Littleton. Tickets: $20 at the door. Prizes will be raffled off, including our grand prize of a Caribbean Cruise for 2, including airfare for 2 to Florida, during the Fall of 2017. Cruise is valued at $3,200. Wear your favorite tropical outfits. Sat. May 29, 2017. A portion of the proceeds will be donated to the ACRONYM film project and used to distribute DVDs of the film. Art, food, music, crafts in beautiful Douglas County!